A vast range of products for fast and efective desulphurisation of steel in Ladle Furnace secondary metallurgy. Our products are multifunctional compromising many parallel actions in one step, enriched with metallic Aluminium to reduce the Oxygen activity in the slag-metal interface and also enriched with Magnesia for protection of the Ladle refractory lining. A range of multifunctional products for Slag fluidisation, enriched with metallic Aluminium and Alumina and Magnesia MgO for protection of Ladle refractory lining. Products containing metallic Aluminium up to 40% for Slag deoxidation, reduction of FeO content in the slag, reduction of Oxygen activity in slag-metal interface to enhance desulphurisation rate. It is also enriched with Magnesia MgO for protection of ladle refractory lining. Refractory tiles preformed to match tundish geometry and to be used as consumed refractory lining. They are highly recommended whenever the tundish will get a limited number of heats. Refractory dry powder based on Magnesite/Olivine/organic binder. It is dry casted between the tundish permanent lining and a suitable metallic form and is set by heating the system to a temperature of 250 - 350 C. The usual thickness is around 40-50 mm. The lining formed lasts for many hours continuous casting. Low cement castable for the tundish permanent refractory lining. Proper mixing equipment and vibration casting is required for correct and effective application. 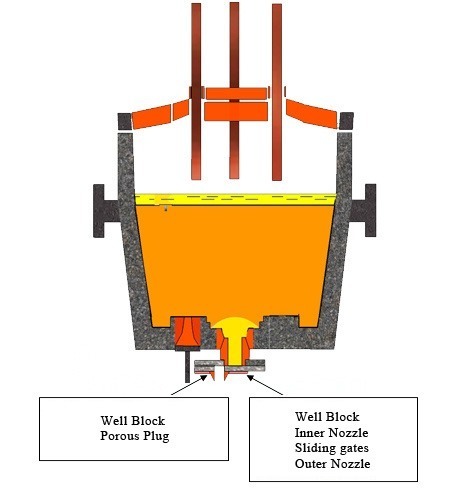 Plastic refractory masses (clay or phosphate bonded) for filling and setting the nozzle well block. 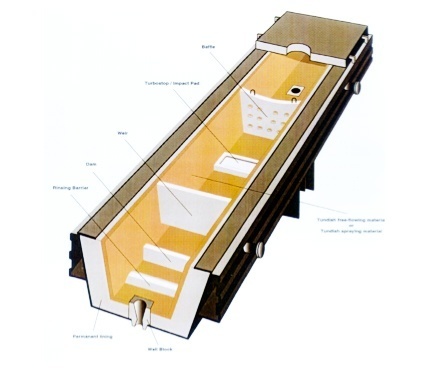 Preshaped refractories of various forms and sizes for the impact tundish area. 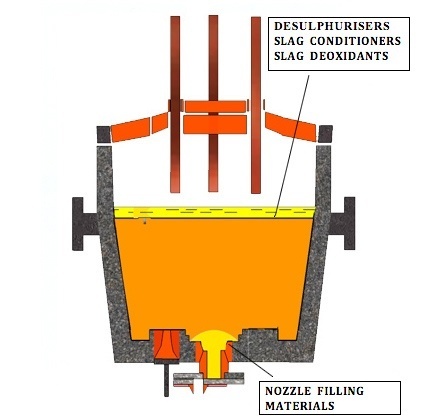 Refractory insulating powders for covering steel melt in tundish during continuous casting. Excellent flowability, good insulation and refractoriness. Preshaped Magnesite tiles to be used in flow zone tundish area for permanent tundish lining protection.